Indonesia is an archipelago made up of about 17,508 islands. The Dutch began populate Indonesia in the early 17th century; Japan occupied the islands from 1942 to 1945. Indonesia declared its independence shortly before Japan's surrender. The capital is Jakarta. The country shares land borders with East Timor and Malaysia. 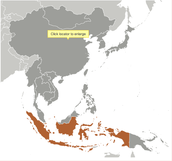 The Indonesian archipelago has been an important trade region. This is Indonesia's flag. Red shows courage, and white shows purity. This is the capital of Indonesia. 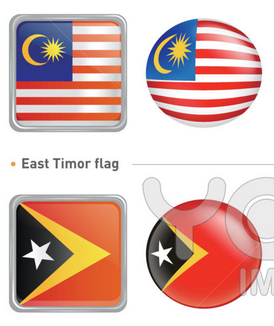 Indonesia shares land borders with East Timor and Malaysia. The top two flags are Malaysia. This is a picture of the Indonesian Archipelago. An archipelago is a series of islands, which ALL of Indonesia is! This is a picture of monsoons in Indonesia. 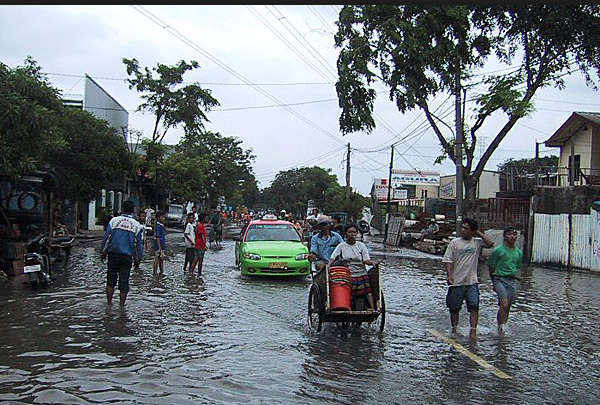 Since Indonesia is an archipelago, it is surrounded by water which means little to huge monsoons. This is the population, religion, sports, and livelihood on Indonesia. The population of Indonesia is 251,160,124. This is a lot of people, filling up 6,000 islands of Indonesia. Islam is the official religion of 85% of Indonesians; Christians (Protestant and Catholic) are about 10%. They are scattered throughout the archipelago. Combined Hindus and Buddhists account for about 4%, and live mainly on the islands of Bali. Traditional sports enjoyed by Indonesians include pencak silat, a form of martial arts, and boating. Indonesians are also fond of soccer. They are also “passionate” about badminton (which rarely fails to earn them Olympic gold). A cool fact is that kite flying is so popular. 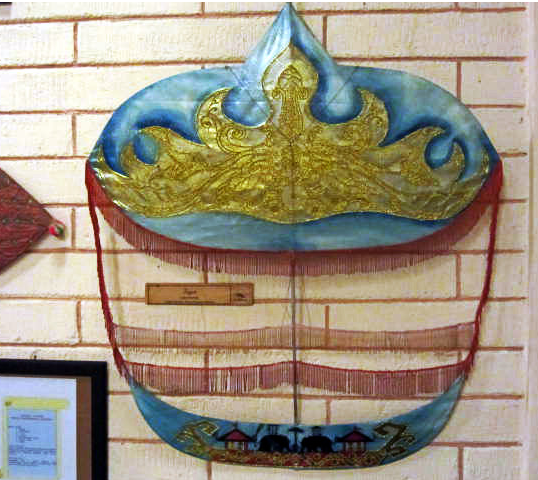 In fact, kites have their own museum, which is the Kite Museum in Jakarta. Part of livelihood is agriculture. Agricultural products involve rice, peanuts, nutmeg, cloves, palm oil, coffee, cocoa, meat and eggs. Some of Indonesia's other main industries are petroleum, natural gas, cement, rubber, textiles, clothing. Tourism is also an important industry. 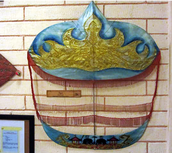 This is a kite at the museum of kites in Jakarta. 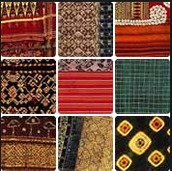 These are nine textiles with different designs. I chose this picture because I like the designs of the textiles, and also that textiles are apart of agricultural products of Indonesia. This is a man representing Indonesia in the 2008 olympics. They are playing badminton which is one of the sports they like to play. This pie chart shows the amount of religion. 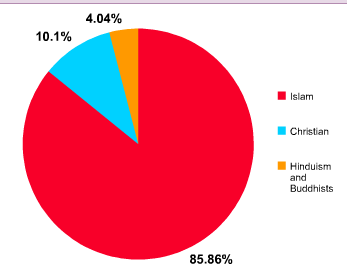 The red is Islam, the blue is christian, and the orange is Hindus and Buddhists combined. There are 251,160,124 people in Indonesia. There are 17,508 islands in Indonesia, which means they can fill up the islands right? Wrong. There are only 6,000 inhabited and the rest are not discovered or even given names. 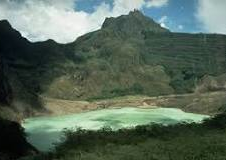 This is a site on traveling to Indonesia. 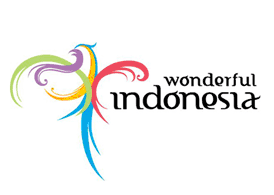 It is an official tourism site that talks about different places to travel to in Indonesia and different events going on. Dutch colonists bring the whole of Indonesia as the Dutch East Indies. Indonesia invades East Timor and incorporates it as a province. Bomb attack on nightclub, more than 200 people die. Car bomb outside Marriott in Jakarta kills 14 people. 1st ever direct presidential elections. Netherlands ambassador apologizes for executions carried out by the Dutch army in the 1940's. Mount Kelud erupts, forcing 200,000 people to evacuate. 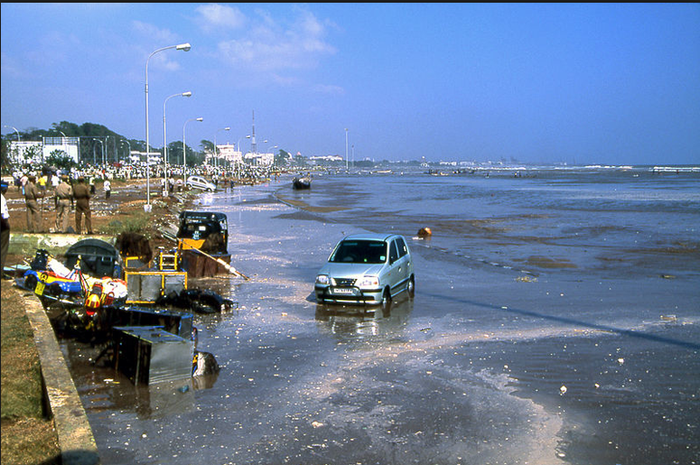 This picture is after the giant waves in 2004. There is stuff everywhere. 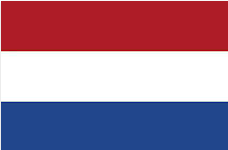 This is a picture of the netherlands flag. Executions carried out by the Dutch army in the 1940's. This is Mount Kelud. It erupted this year, forcing 200,000 people to evacuate. In Indonesia, they have the right to vote. 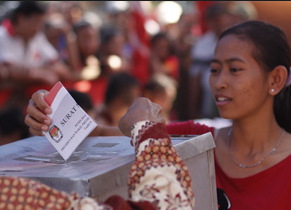 The voting age in Indonesia is 17 but anyone who has an ID card can vote. For education, it's six years at elementary level and three in secondary level. In Indonesia there is the supreme constitutional, public, religious, administrative, and military courts. The highest court is the supreme court. There are serious human right concerns in Indonesia. Four amendments to the Constitution of Indonesia. They have new form of the executive, judicial, and legislative branches. 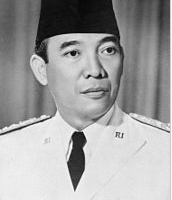 Sukarno is Indonesia's president. He became president in 1998. The president appoints a council of ministers, who are not required to be elected members of the legislature. 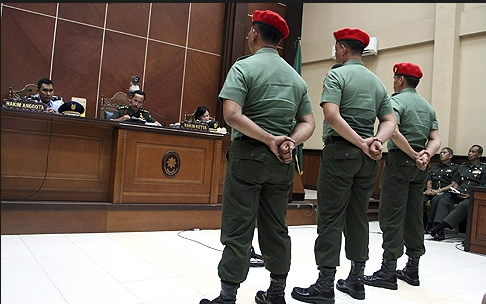 This is a military court in Yogyakarta. 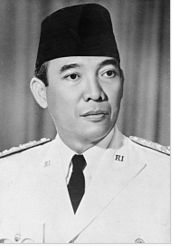 This is Sukarno, Indonesia's founding President. This is a girl putting her voting slip into the box. Indonesia has a mixed economy which both the private sector and government play important roles. 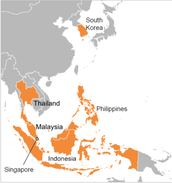 The country is the largest economy in Southeast Asia. Indonesian president said Indonesia will be in the top ten countries. They will be with the strongest economy within the next decade he says. Agricultural products involve rice, peanuts, nutmeg, cloves, palm oil, coffee, cocoa, meat and eggs. Some of Indonesia's other main industries are petroleum, natural gas, cement, rubber, textiles, clothing. Tourism is also an important industry. Agriculture, had been the country's largest employer for centuries. Indonesia was the country who was hit the hardest by the Asian financial crisis of 1997–98. During the crisis there were sudden and large capital outflows. Indonesia's currency is a money called rupiah. Rice is one of Indonesia's agricultural products. This picture shows the countries most hit by the Asian Financial Crisis. This is Indonesia's currency. They have a coin and paper money, which the paper money is called Rupiah. The reason I think Apple would want to invest in Indonesia is 30 million cell phones are sold there each year. That's a LOT of cell phones, making it easy for Apple to invest in Indonesia. 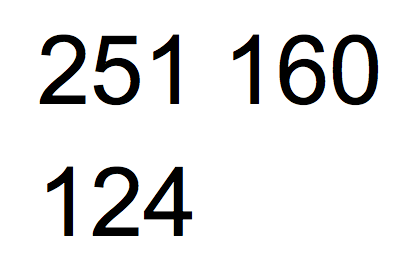 There are 251,160,241 people, which would make it easy for them have cell phones and tablets purchased. There are 6,000 islands inhabited, making it easy for Apple to spread their companies in Indonesia if they wanted to. Apple could be able to sell more than one product if they wanted to get more part of the 30 million cell phones sold each year. I think DirectTV would want to invest in Indonesia because there is not that many networks in Indonesia. In fact there is only 10. DirectTV could work with these networks and ask them if they will do there shows on DirectTV. Since there are so many people in Indonesia, they can get DirectTV. There are different islands that DirectTV would be able to choose from to. They would be able to choose which island. I think Lundberg would like to invest in Indonesia because rice is an agricultural product of Indonesia. Lundberg makes all different types of rice products. If they went to Indonesia, they could invest in the rice. They could make a lot of their products there. 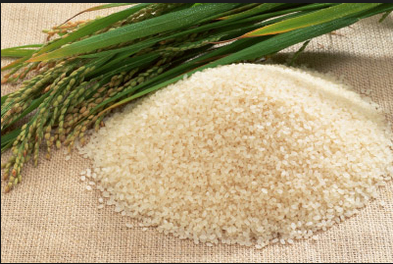 Lundberg could even grow their own rice in Indonesia and also get their rice from places in Indonesia. Wakefield peanuts would like to invest in Indonesia because peanuts are on of Indonesia's agricultural products. Wakefield makes more than peanuts. It makes different types of peanuts, and peanut brittle. Wakefield could sell a lot of peanuts to people in Indonesia. There are so many different types that Wakefield could sell them all to the people in Indonesia. There are 251,160,241 people, which could make it easy for them to find people in Indonesia who want to buy their peanuts selection and brittle. 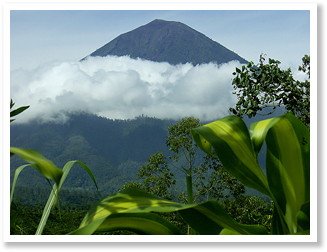 Fair Trade would like to invest in Indonesia because cocoa is also one of Indonesia's agricultural products. If Fair Trade makes something new, they could introduce it to the people in Indonesia. 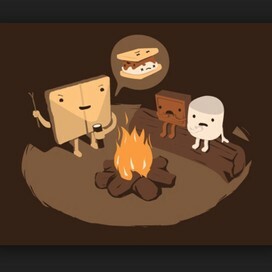 Since Fair Trade makes different products, they could use their products to help show ways they make food. Also they could show the way they grow the ingredient-cocoa. It could help a lot more cocoa be in Indonesia.